The village of Barking straggles along the busy B1078, which is unfortunate. But it is surrounded by beautiful countryside, with woodland groves to the east, and surprisingly steep hills to the west. In common with several villages around here, it has a tye. This is a large, open common, originally intended for grazing sheep and cattle that were en route to market from other parts of the country. Shepherds and cowherds would obviously use local inns and services, and thus a community would grow up adjacent to the village. There are quite a few of these tyes in Suffolk, and Barking Tye is one of the biggest. During World War II, it was put under cultivation for food, and disappeared, indistinguishable from surrounding fields. It remained so until the 1960s, but it is now slowly being returned to its natural state. This will take time, and it still looks rather bleak and barren. But the Parish Council, which owns the tye, is to be congratulated for its efforts so far. 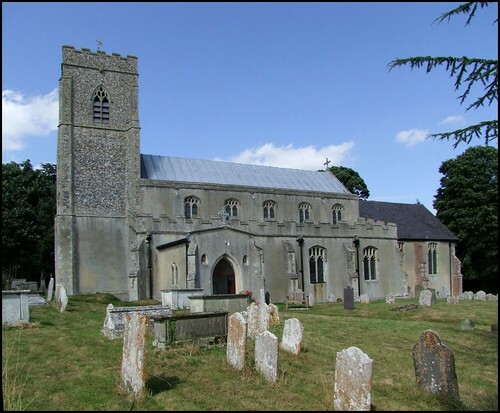 St Mary, in common with nearby Combs, is one of Suffolk's grander churches. Until the 20th century, it was also one of the county's more populous parishes, including as it did the whole of the town of Needham Market, where St John the Baptist church was just a chapel of ease. All the dead of Needham Market came here to be buried, conveyed the mile up the hill on a bier along the Causeway. This is a journey you can still make today, albeit under your own steam. Local legend has it that the word 'causeway' is a corruption of 'corpseway'. Most living people will approach the church from the south, up a narrow footpath between fields. This steep lane leads you into the very attractive churchyard, which seems to have been lent an urban quality by its former association with Needham Market. The fine Cedars of Lebanon are a legacy of a 19th century vicar, who was a botany enthusiast, and collected seeds from around the world. The journey to the church used to be one with which you got fairly familiar if you were a church explorer, since this grand church was kept locked with a keyholder back down in the village. I remembered my first visit, pushing my bike the steep climb up to the church and then having to come back down again. I'd collected the key from a nice man who was painting his gate, steeled myself, and then took on the long climb again. Today, this church is open every day, although this does mean you will miss out on an experience I had about ten years ago, which I shall tell you about in a moment. The grand south porch protects a door with some medieval carving, despite a considerable restoration. There is another one on the west side of the tower, and a smaller, 19th century porch on the north side. The tower is in perfect proportion to the nave and chancel. In fact it's a bit too perfect; which isn't surprising, since it was rebuilt in 1870. The grand 15th century clerestory and 14th century gargoyles are terrific; and although the whole thing is cement-rendered, there is still a very pleasing harmony about it. This is a huge church, and the eye is drawn eastwards to one of the best screens in the county, retaining a rare survival, the coving that supported the roodloft. It is intricate and beautiful. This on its own would be worth coming to see. On either side at the east end of the north and south aisles are two gorgeous parclose screens, which once surrounded chantry chapels. It is a blessing that altars have now been returned to them, and the one in the south aisle is dedicated to the Blessed Virgin, that in the north to St John; survivals in both chapels point to an Anglo-catholic enthusiasm early in the 20th century. The north screen is carved delicately and painted beautifully. The lion pendants may be familiar to regular users of this site. The south screen matches it, but without the paint; it is also heavily restored, after an arson attack in 1974. Standing back from them both, and taking the roodscreen in as well, you can see that the rood loft must also have gone over the parclose screens, as at Dennington. There are more fine Barking lions around the stem of the font. There is an outstanding quality to the work in this church. For example, the decorative terracotta panelling to the window beside the north door, which would be quite at home in any great urban church. It depicts vine leaves, flowers and strawberries, and it was possibly brought here from the original Shrublands Hall a few miles off. There is more at Henley and Barham. The nave roof is one of the sturdiest of all Suffolk roofs. It was probably built with oak from nearby Priestley Wood. Given the proximity of the wonders of Needham Market, the people of this parish certainly knew how to build roofs. The restoration Royal Arms proclaim God Save King Charles the Second, just in case you missed the point. Stepping into the chancel, through the magnificent screen, you find a space cleared of clutter, and the light from the interlocking Ys of the east window illuminating the stalls set against the south wall. The tracery on them is clearly medieval, and matches that on the rood screen. Given that rood screen and parclose screen are fully intact, we may presume that this came from the rood loft itself, in which case it is another rare survival. All in all, this is a glorious church which lifts the spirits. Ten years ago, however, I was struck briefly by a different emotion. You will remember that I had got a key from the village, and I had let myself into the priest door with it. The door had shut behind me with a satisfying clunk, and so when I went to let myself out I inserted the key to open it again. It wouldn't turn. I tried again. Gradually, it dawned on me that the key only worked from the outside, and that the hook beside the door handle was intended to slip over it to prevent the latch from going home. I had not spotted this, and consequently I was locked in. Well, I didn't panic. If the worst came to the worst, I had my trusty mobile phone. I checked the screen to make sure there was a signal. There was no signal. Rather more frantically, I went and looked for another way out, and discovered that I could unhitch, unlatch and unbolt the Fort Knox-like structure of the south doors. It was like a massive jigsaw puzzle. At last, I saw daylight! I went round to the priest's door, let myself back in again, carefully hooked the door handle, rehitched, relatched and rebolted Fort Knox, and stepped back out the priest's door, which closed with another satisfying clunk. I took the key back to the bungalow at the bottom of the hill. The nice man was still painting his gate. "Thanks very much, it's a smashing church", I said. "Good", he replied. "Glad you enjoyed it." I went to get on my bike, but then turned back to him. "By the way, I manged to lock myself inside", I confessed. He laughed. "Oh, everyone does that", he said, and cheerily waved me off. As I pedalled onwards, it occured to me to wonder what would happen to people who didn't manage to escape through the south porch. Presumably he would go and let them out, if they hadn't returned the key after an hour or so. And then I thought that it made rather a good metaphor, a church that was easy to get into and hard to get out of, and you could construct a good sermon around it. And then I thought, the next time a churchwarden complains about the declining congregation of their church, I shall suggest they fit a door like this.